12x16 gambrel style roof with plans for adding a nice shed loft. All treated lumber for floor and long lasting 'smartside' siding. 5' double shed doors and ramp plans. 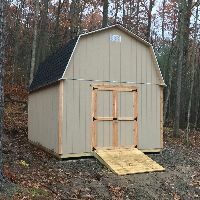 12'wide x 16' Gambrel Shed plans. 2x4 construction with 12" on center treated floor joists. 2x4 wall construction 2' on center. Pre-assembled shed roof trusses make framing this shed roof a breeze. Double 5' swinging shed doors are easy to build. Plans show 'smartside' 4x8 pre-primed siding panels for long lasting construction.